Whether you want a driveway that is simple and functional or eye-catching and elegant, you need to consider a number of factors and options to achieve the best results. Why do we drive on the parkway and park on the driveway? That’s just one of life’s little mysteries, but there’s no mystery involved in creating a beautiful and practical driveway—just some thoughtful planning. 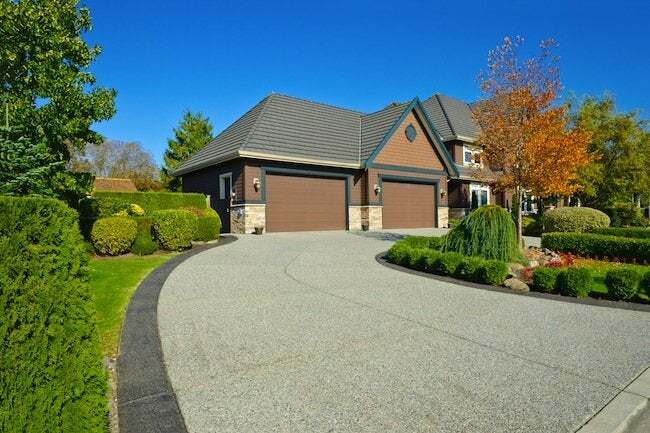 Your driveway makes a big first impression, whether you realize it or not. Its size, shape, and surface material are certainly important considerations. So too are other aesthetic and practical issues, such as the architectural style of your house, the amount of space you have, how many vehicles you need to accommodate, and even the part of the country where you reside. Use this driveway planning guide to help you determine the best driveway for you and your home. Although you’ll be constrained by the natural topography of your property, there’s definitely a desirable “sweet spot” for the slope of a driveway, neither too flat nor too steep. If it’s too flat, drainage may become an issue, and if it’s too steep, the surface becomes slippery and dangerous. As a general rule, a driveway should be less than a 15% grade, which means that it should not rise more than 15 feet over a distance of 100 feet. If your driveway is completely flat, however, be sure to build up the middle so water runs off the sides and doesn’t pool. Also, you’ll need to direct the runoff to an appropriate place. If your driveway is very steep and long, you may have to add curves or switchbacks to reduce the slope. Another general rule is that your driveway should be around 10 to 12 feet wide, and a few feet wider at the curves. If you have space, it’s always a good idea to provide a larger area at the top for turning around or for additional parking when needed. A 12’x18’ space or larger is ideal for this. This decision is partly aesthetic and partly functional. In general, a curved driveway will add more character and depth than a straight driveway, but if you have limited space or a very short distance from the street to your garage, then straight will have to do. You can add character to a straight driveway using interesting borders, stamped concrete, color variations, or intricate patterns. Long, straight driveways can also be very attractive if they are lined with trees and frame the property as you approach. Sometimes a curved driveway may actually function better, not just look better. This may be the case if there are obstructions in the direct path to the garage, such as trees or other landscaping features, or if your access point from the street doesn’t line up with the garage or parking area. If you do decide on a curved driveway, the curves should be gradual and sweeping, never tight and cramped. Circular driveways offer the benefit of not having to back out; if you live on a busy street, this may be an important consideration. Keep in mind, however, that if you don’t have a garage and you have more than one vehicle using the driveway, then only the first car in has the luxury of not backing out. A variation, the teardrop driveway, is similar in that it splits off into two paths, but it has only one access point from the street. Either way, a circular drive will take up quite a bit of real estate in your front yard, so this isn’t the best choice for everyone. The main purpose of your driveway is utilitarian, but there’s no denying the impact it has on your home’s curb appeal. When you’re planning your driveway, consider how it will look and how it will tie in to the rest of your property. To get ideas, take notice of other driveways in your neighborhood and think about what you like and don’t like about them. You can still create a unique design, but there’s nothing wrong with surveying what’s already been done and borrowing a few ideas. Consider adding plants, lighting, or a front gate if you really want to boost your curb appeal. There are quite a few choices when it comes to the material for your driveway. The most common options are gravel, asphalt, cement, and pavers. Within each category there are plenty of variations as well. Your budget will dictate the material to some degree—we have listed them from least to most expensive—but other practical and aesthetic considerations will come into play too. Just a few of these are the slope of your lot, the style of your home, and the severity of the weather in your neck of the woods. Here’s a quick rundown of each material’s pros and cons. Gravel – This is the most affordable option, but that doesn’t necessarily mean it is inferior. If installed correctly with properly compacted subgrade, durable block edging, and a shallow surface layer of pea gravel, you can create a driveway that will stand the test of time without requiring an unreasonable amount of maintenance or loss of aesthetic appeal. A well-designed and properly built gravel driveway is especially attractive for certain styles of home. Plus, gravel has the added benefits of providing quick water drainage and never cracking or splitting. 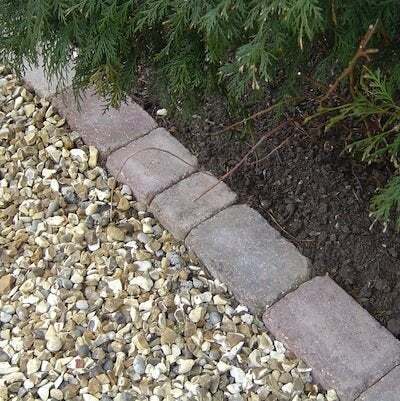 To add character to a gravel driveway, use decorative edging to contain the gravel, and pick a gravel color that will complement your home and yard. Keep in mind that weeds and grass can grow through gravel fairly easily if landscape fabric or some other underlayment is not installed. Also, if your driveway is too sloped, gravel may not be ideal because it will slide down. And if you live in a colder climate, plowing snow from a gravel driveway can be a hassle. Asphalt and Cement – Asphalt and cement are both very durable and popular choices for driveways. Asphalt is typically cheaper, although the price has recently risen along with the cost of oil, so the savings here are not what they used to be. Both materials are versatile. They can be colored, stamped, engraved, stained, or grooved to add interesting aesthetic dimensions. Over time, however, they can also crack and split, and collect stains from oil and tires. Also, because these materials are not permeable, the driveway must be designed with water drainage issues in mind and properly sealed. But overall, they are both solid choices. 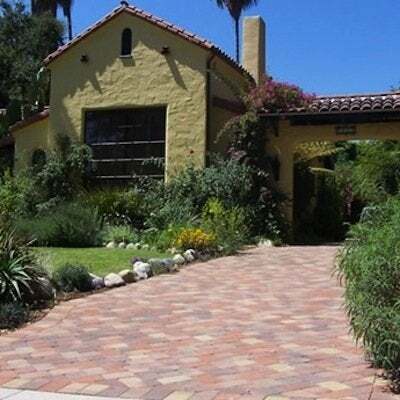 Pavers – Considered the most sophisticated option, pavers are also the most expensive. They’re also endlessly versatile when it comes to shapes, sizes, colors, and patterns. Pavers are very durable and they tend to have good drainage properties, because water can escape through the gaps. Unlike asphalt and concrete, pavers don’t generally crack or split, and small areas are easy to replace if problems ever do occur. 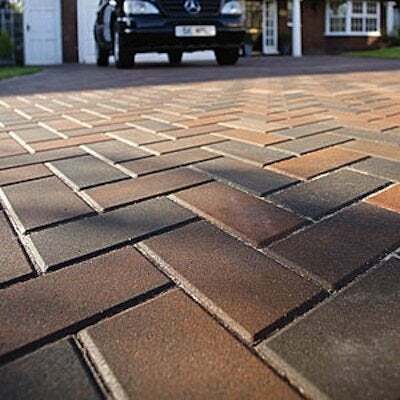 Permeable interlocking pavers have become very popular lately. These are engineered with uniform gaps and installed on a granular base rock to allow very efficient water runoff. They have a clean look and are available in different shapes, sizes, and tones. This planning guide should get you well on your way to designing a driveway that adds curb appeal, functions properly, and suits your particular needs and style. Our last bit of advice is to think long term; you don’t want to revisit this project in the future. Resist cutting corners to save a little time or money. Remember, nothing is more expensive or time-consuming than doing the job right the second time.